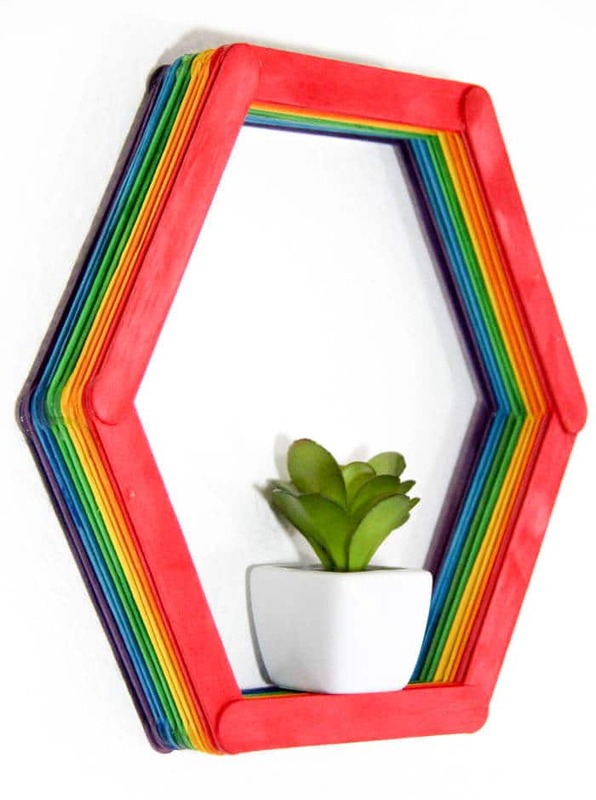 This modern popsicle stick shelf can be great way to add some dimension and pops of color to your wall. As a young family, we’re always looking for inexpensive ways to decorate our room and house that is both fun and functional. 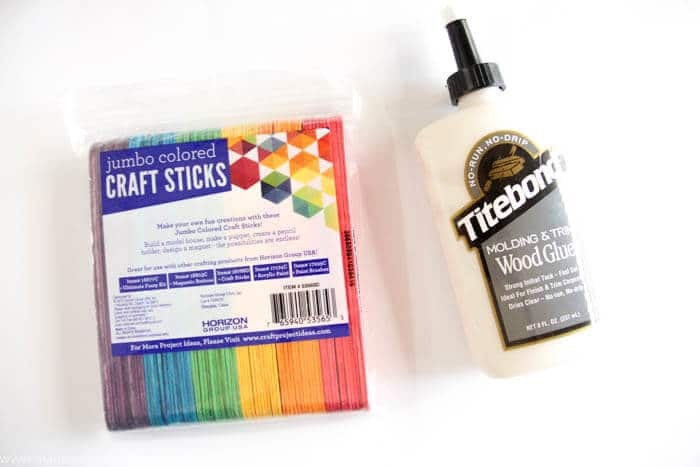 For years, we had used these craft sticks for different art projects and bird houses and it wasn’t till recently when my daughter asked for a couple little shelves to display a few pieces of clay that she had made. 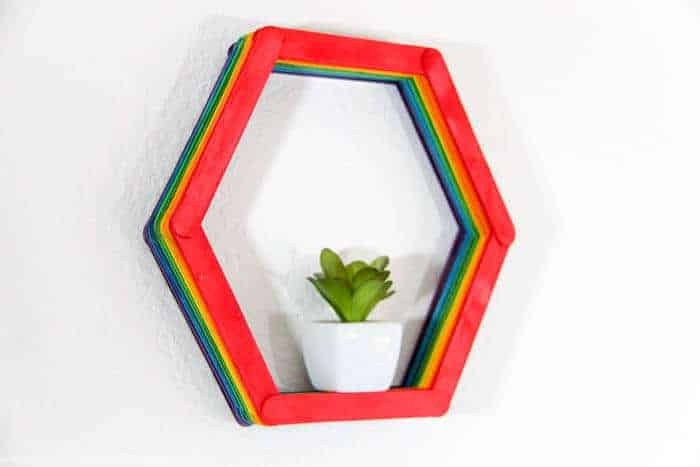 In looking through what I had, it dawned on me, that we could make a really cute little shelf with just one package of jumbo craft sticks and some wood glue. What I love about this project is that you can make it whatever color or stain you want your shelf to be. If you are looking for a more wood grain stain look, then grab these and the stain of your choice, and then put it together the same way. First start by placing your craft sticks into a hexagon shape where each corner varies from top to bottom of the next craft stick. A dot of wood glue in each of the six angles and continue to build. For the package of 75 sticks that I had, I made two layers of each color. 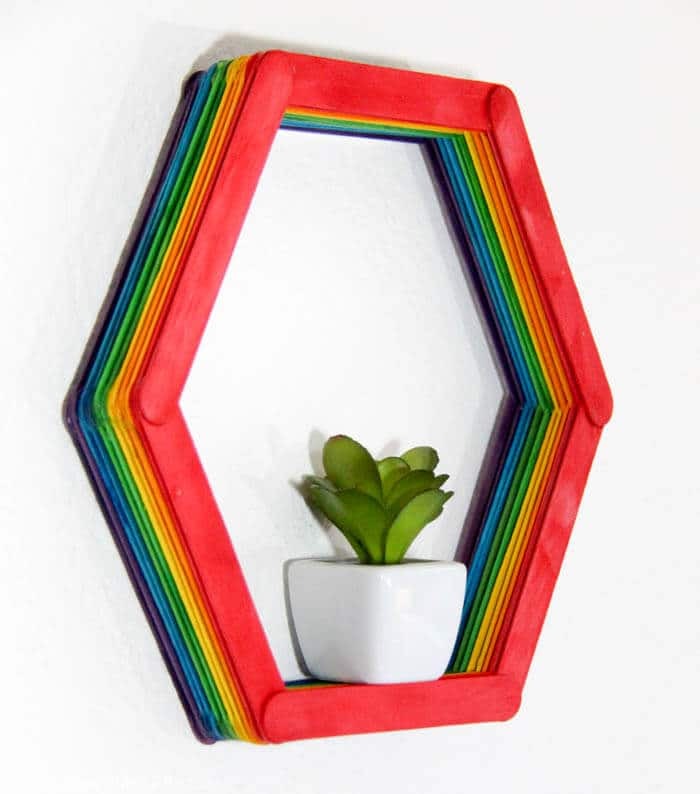 If you would like the shelf a bit thicker, use two packages and four of each color. 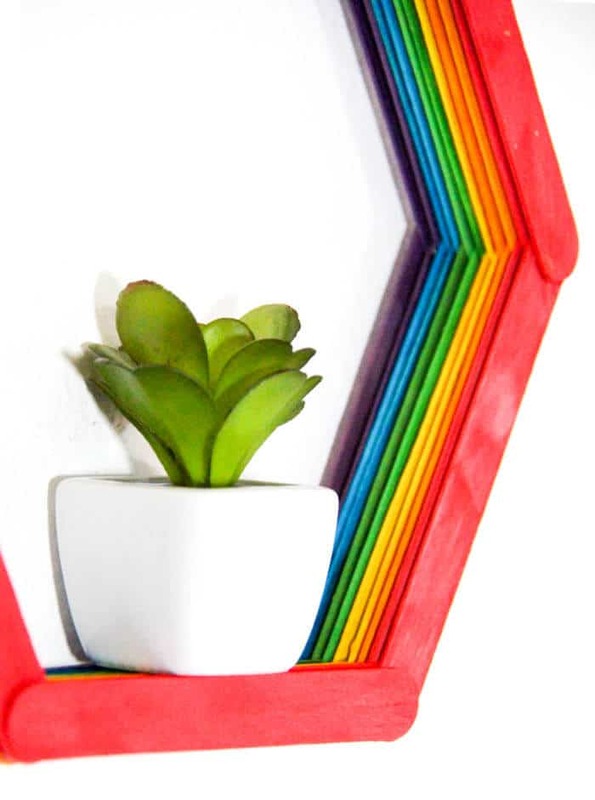 If you creating all one color shelf, then continue to build until it is the thickness you prefer. 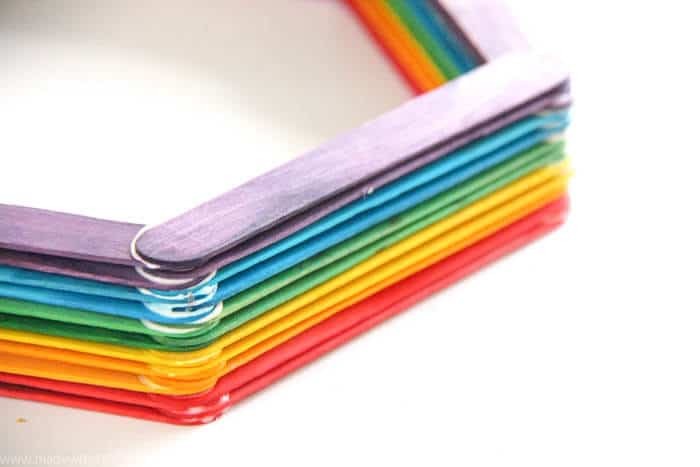 Once you have finished gluing all the sticks of your shelf. You must allow it to dry. If you have a clamp, clamp the joints where you have glued them, or if you are less fancy like myself, I used a heavy book to add weight while it dries. Once it dries, viola! You have a shelf. You can hang using command strips or simple nails. What a cool idea! 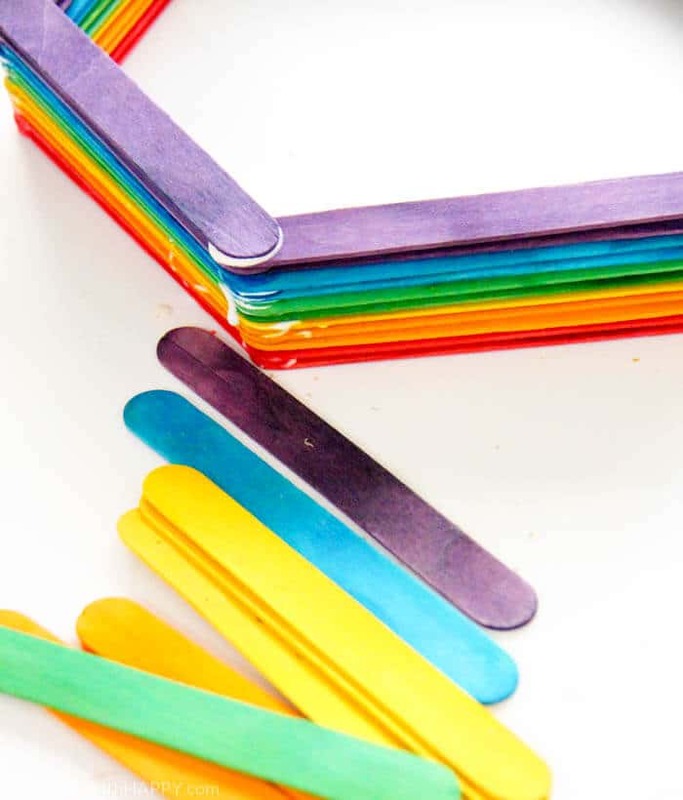 I’ve got a bunch of plain popsicle sticks I haven’t used. I think I could make quite a few shelves with them.